This question relates to the rebuild of a 1979 900 Replica (MHR). Question relates to part numbers 0628-49-040 (Spacer) and 0960-74-040 (Distance Tube). Hi, I am restoring a 1979 bike, number 146. I have a query around the small metal spacers that are used in the assembly of the rear mudguard. The parts list and exploded diagrams I am working off show 5 distance tubes, the three around the rear numberplate holder and two on the rear indicator stem. Then the lowest and closest mounts to the engine show two off the spacers listed above, I don't seem to have those from my strip and I can't find them with any UK parts supplier. I have bought 5 reproductions of the distance tube, but can anyone give me the dimensions and maybe a photo of the part number 0628-49-040 Spacer that is used to mount the lower edge of the rear mudguard to the frame nearest the engine please? 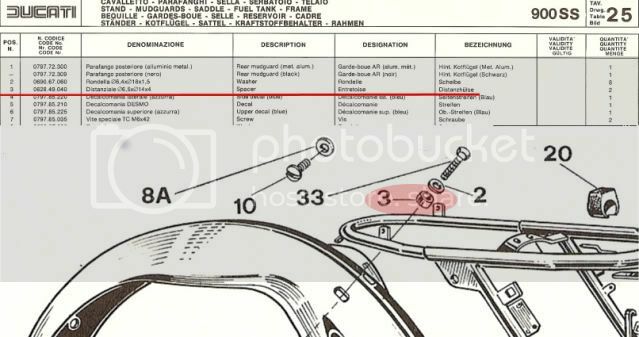 That part appears common to the 900SS and the parts book for that more (help)fully lists it as "Distanziale (Spacer) ø6,5 x ø14 x 4". Hiya, can you help the uninitated with how to interpret the dimensions? Is it internal diameter, external diameter and length - doesn't see right as 4mm sure isn't very long? And that can't be right as it can't be 14mm outside diameter - that's a washer!!!! 6.5 internal is possible as the bolt that passes through it is a 6mm from memory so that makes sense. That's the way I interpreted it (ID, OD, L; in mm) yes. I suspect those are correct i.e. a thick washer. In the absence of anybody else confirming I'll "eyeball" mine tomorrow (assuming I have them in place!) and confirm. Here's the stuff from the 1979/80 900SS parts book, Stuart (I've amalgamated the diagram and the description). Now that I have the dimensions as oppose to the drawing I actually think I have these two in my box of parts that I had blasted and bright zinc plated....they are kind of big thick washers - so will go get them from the garage and the vernier gauges....fingers crossed. Thanks to all for their help. Keep you posted. If you have any thoughts on the steering head bearings on another of my posts I started (the taper roller races over the base stem) I'd be really grateful.